Here is all the information you need to start enjoying birdwatching right away. Learn what to look for when you see a bird you don't recognize. Discover what you can learn from a field guide (bird book). Find out how to choose and use binoculars. Get tips on the best times and places to watch birds. For years, I wished I had a complete starter kit for somebody who's just getting into birdwatching. Everything you need in one inexpensive package -- binoculars, field guide, and all the essential knowledge. The basic stuff, so you can get into the fun of birding right away. And here it is. First, binoculars. The Eagle Optics ENERGY is a good choice for a beginner who wants to get in as economically as possible. The Energy will fit in a shirt jacket, and it feels like it doesn't weigh anything. Many people like this binocular for the theater or sports, too. Next, I chose the Stokes Essential Guide, because it's compact -- fits in a jeans pocket, and includes the birds you're most likely to discover as you're first starting to watch birds. Later on you may wish to become expert on birds found only at sea or that live in very limited areas, but this is a great place to start, without being overwhelmed. 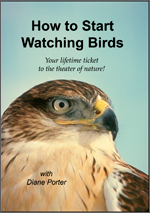 The DVD is Diane's own course, How to Start Watching Birds. The whole kit is designed to be the easiest, least expensive way to start birding. You get a lifetime ticket to the theater of nature for less than a pair of designer sneakers. Welcome to the wonderful life of being aware of the birds all around us.